4th year Pic 228 - Oct - 05 2012. Mini train , South India Critiques welcome! The Nilgiri Mountain Railway (Mini train) is a railway in Tamil Nadu, India, built by the British in 1908. The NMR track is 1,000 mm (3 ft 3 3⁄8 in) gauge and was pulled by steam engines made in Switzerland which are now replaced by diesel locomotives. 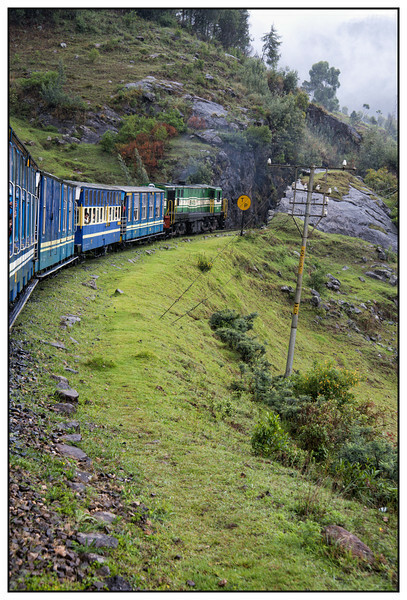 In July 2005, UNESCO added the Nilgiri Mountain Railway as an extension to the World Heritage Site. more info at http://en.wikipedia.org/wiki/Nilgiri_Mountain_Railway ADDED: The train starts from Coimbatore (1068 ft htl) and goes up to Ooty ( 7,228 ft ) traveling through16 tunnels and over 250 bridges, covering a distance of 46 km (28.6 mi) in 4.8 hours. We boarded from Coonoor which is approx 18 kms(10 mi). Wonderful point of view that you captured this from! What a wonderful shot Harsh, and I really enjoyed reading all the information. I will definitely be sharing this with my husband, he LOVES trains. Neat perspective; sounds like a fascinating train ride. Great shot and POV...were you on the train?